McGill’s Facilities Operations and Development unit simply can’t be everywhere at once. That’s where the humble building director (BD) comes in, acting as the on-site eyes and ears for all things brick and mortar. 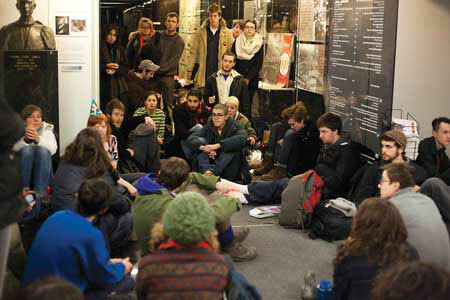 There are 97 BDs across McGill’s two campuses, and most of them are volunteers juggling an unrelated full-time job. There is no typical BD. Some are profs, while others work in administration. Some of their buildings are dedicated to teaching, some are filled with high-tech research labs. But talk to enough building directors and three common themes emerge: (1) Being a BD is a rewarding gig, despite the fact that (2) their efforts largely go unnoticed unless there’s a problem. Oh, and: (3) They were bamboozled into accepting the position. Remember these useful phrases in case you someday need to convince an unwitting colleague to become a BD. 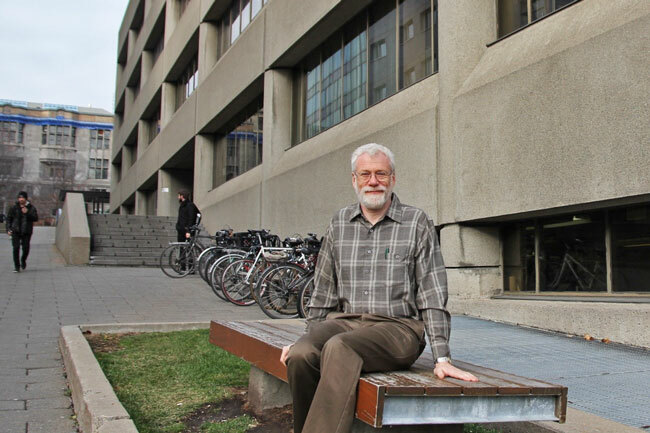 “I got fingered, it’s as simple as that,” recalls Dominic Ryan, a physics prof who does unpaid double-duty as the building director for the Ernest Rutherford Physics Building. “The person who was doing it was going on sabbatical and just needed someone to step in.” Ryan chuckles. “He never came back.” That was more than 20 years ago. When asked to estimate how many hours of his week are spent doing BD duty, Ryan makes a sound more laughter than number. “There’s always something happening,” says Ryan, who joined McGill in 1986. “This morning, for example, I was dealing with the rebuild we’re doing on the washrooms on the main floor because there’s a leak between the walls that’s affecting the lab below.” His mandate as building director is, to put it charitably, flexible. Although he doesn’t allocate space, or manage construction projects, or oversee safety issues, Ryan regularly weighs in on all those subjects, and more. Rosemary Cooke, too, is familiar with the wide range of BD activities. While working in the McGill Secretariat, she “sort of evolved” into being BD for the James Administration Building. She maintained that sideline for two and a half years, until she became the director of the Faculty of Dentistry. After a brief respite from double-duty, she again assumed the BD mantle in September 2014, when the Faculty moved into its new facilities on three leased floors of a non-McGill building located across the street from the Roddick Gates. Although building directors are often required to come up with contingency plans on the fly, Cooke explains that a big part of the job is simply educating people about what does, and what does not, fall within the BD purview. “We’re not necessarily responsible for everything in the building,” she says. To aid in this educational outreach effort, here is a pop-quiz. Which of the following items are the responsibility of the building director? 3. If you even think about saying the words “The microwave’s broken” to a building director, you will get an earful about how equipment is your unit’s responsibility, not the BD’s. And your soup will be cold. “I think the building director role can be misconceived as someone who is in control of a situation,” agrees Donald Nycklass, the associate director of Facilities Management for Student Housing, “whereas they’re really mediating the situation using the information that they have.” Because of the sheer scope of student housing – there are 38 different buildings, ranging from the four large halls overlooking Molson Stadium and the three converted hotel hi-rises to dozens of smaller row houses and apartment-style buildings – Nycklass oversees three full-time, not volunteer, building directors. Their basic concern, however, is the same as any other BD: Keep the infrastructure functioning with minimal inconvenience to the residents. Nycklass and his team are responsible for controlling who comes into the residences, and giving students ample notice when there will be water and electrical shutdowns or interruptions. (Or, in the case of an extreme interruption, such as the fire that broke out in an upper wing of the Royal Victoria College residence this past February, finding temporary accommodations for displaced students.) Nycklass relies on a mix of hi-tech (Facebook, e-mails) and old-school (putting up posters in elevators, knocking on doors) to get the word out. Considering that, on any given week, there’s some kind construction or maintenance in one of the 35 student residences, there’s always a word to get out. Marilena Cafaro understands those mediation challenges. She is another full-time building director, overseeing the Faculty of Medicine’s 26 buildings. In addition to the big iconic buildings, like McIntyre Medical or the Genome Building, the Faculty works in several repurposed Square Mile mansions, as well as rented facilities in the downtown core. 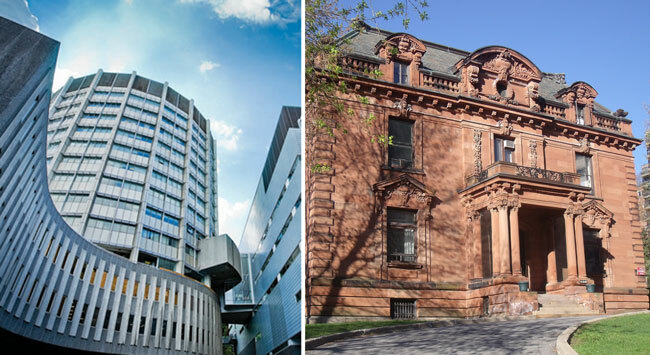 Marilena Cafaro oversees 26 Faculty of Medicine buildings, including the iconic McIntyre Medical (left) and the heritage Hosmer House. Cafaro notes that the Faculty of Medicine’s many heritage buildings, such as Davis House and Hosmer House (both former private homes now used by Physical and Occupation Therapy) are a double-edged sword: gorgeous buildings that, by dint of their advanced age, require perpetual maintenance. But, as Dominic Ryan can attest, a building need not be a great beauty in order to be a perpetual construction zone. Nobody would rank the Rutherford Building, built in in 1976, among McGill’s architectural gems. “But it’s solid and really functional,” says Ryan, and that means it gets put through its paces. That kind of engagement is also important to Rosemary Cooke. Just as the new Dentistry facilities were designed to bring people together by combining classrooms, clinics and social outreach under one roof, she finds that her BD duties help her to be even more engaged with students and staff in a way she doesn’t get from her “general budgeting and HR stuff” duties as director. Prof. Ryan’s emails are also the most funny emails we ever get from anyone in McGill. They contain all the relevant information, but expressed in the most entertaining fashion.